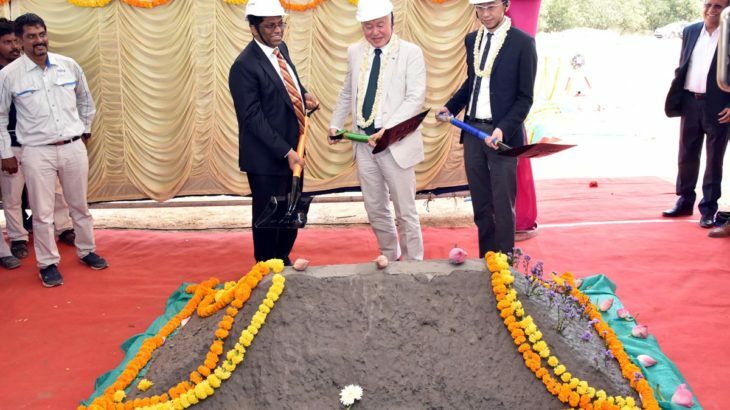 Sri City, March 20, 2019: – M/s Daiki Aluminium Industry India Private Limited, a 100% subsidiary of Daiki Aluminium Industry Co. Ltd., Japan, held groundbreaking ceremony in Sri City on Wednesday, marking the start of construction of its aluminium alloy plant. Mr. Takaaki Yamamoto, President of Daiki Aluminium Industry performed foundation laying ceremony in the presence of Mr. Zhao Rong, Chairman, Delta Group of Industries, China, Mr. Ravindra Sannareddy, Founder Managing Director, Sri City and a host of senior managers of Daiki Group. Addressing the gathering Mr. Takaki Yamamoto traced the history of Daiki Aluminium group and its major achievements. Highlighting the ‘green principles’ in production, he said that they aim to use the latest technologies in pollution control measure adhering to the strict regulation of their parent plants in Japan. He thanked the state government and Sri City management for the support being rendered. “We are sure, their entry will certainly enhance the symbiotic ecosystem in Sri City, benefiting the auto component manufacturers. It is very heartening to note, this plant will provide ample job opportunities to the local workforce, particularly for women. We look forward to work closely with Daiki team and assure our support,” he added. The plant, which will be built in a plot of 20 acre in the Domestic Tariff Zone (DTZ) at an initial investment of around Rs.250 crore, is expected to be commissioned by February 2020. The plant will produce aluminium alloy ingots at an annual capacity of 84,000 tonne. The products will be exported to ASEAN and Japan for supply to automobile companies. Daiki plans to capture the demand requirements of aluminium alloy in the country and expand the market sequentially. It will generate direct employment for about 600 people, and 80% of them will be women. According to Andhra Pradesh Economic Development Board (APEDB) sources, AP Government looks forward to a long, sustained and mutually beneficial relationship with companies like Daiki Aluminium, which are eco-friendly.